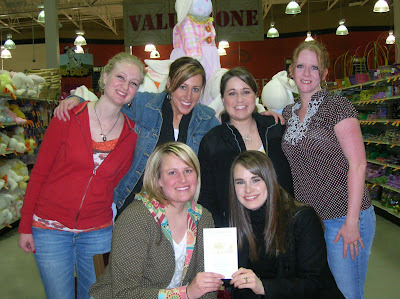 Last night I got together with some of the girls from my ward growing up. I was blessed with such a great group of ward friends (girls & guys) and getting together with them is always just like old times again. We went to the movie Taken, which was awesome!!! Then we went out to eat and laughed ourselves sick as we reminisced about the good ol' days. As we were chatting over dinner we got talking about one of our guy friends (Ryan) from the ward whose wife is very, very sick with multiple inoperable brain tumors and decided to walk over to a grocery store to buy them a card (that's what they are holding in the picture) to let them know that we were thinking about them. Our hearts just ache for him and his little family and we are hoping and praying for the best. Please keep them in your prayers.